North Carolina is a Southern state of the United States, and contains the site of the first English colony in the Americas. The state is also famous for containing the site of the Wright Brothers' first flight (Kill Devil Hills). 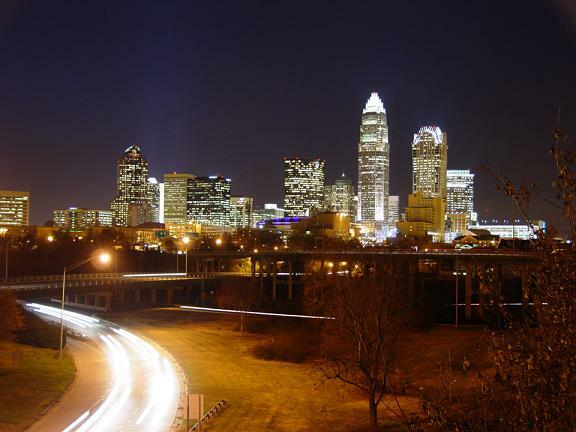 The capital of North Carolina is Raleigh, and the largest city in the state is CharlotteOther important cities in North Carolina include: Asheville, Cary, Durham, Fayetteville, Gastonia, Greensboro, Greenville, High Point, Jacksonville, Wilmington and Winston-Salem. North Carolina is well-known for outdoor recreation with 34 state parks and 14 national parks in the state. There is also some excellent skiing in North Carolina. Tourist attractions in North Carolina include the USS North Carolina (in Wilmington) the North Carolina Transportation Museum (in Spencer), Paramount's Carowinds near Charlotte, and Wet'n Wild Emerald Pointe in Greensboro. If you get the chance, be sure to also check out the annual Barbecue Festival in Lexington. Some of the leading educational institutions in North Carolina include Duke University (in Durham), the University of North Carolina at Asheville (in Asheville), the University of North Carolina at Chapel Hill (in Chapel Hil), the University of North Carolina at Charlotte (in Charlotte), the University of North Carolina at Greensboro (in Greensboro), the University of North Carolina at Pembroke (in Pembroke), the University of North Carolina at Wilmington (in Wilmington) and Wake Forest University (in Winston-Salem). Sports teams in North Carolina include the Asheville Tourists (South Atlantic League baseball) in Asheville, the Carolina Hurricanes (ice hockey in the NHL) in Raleigh, the Carolina Mudcats (Southern League baseball) in Zebulon, the Carolina Panthers (American football in the NFL) in Charlotte, Carolina Railhawks (USL-1 soccer) in Cary, the Charlotte Bobcats (National Basketball Association) in Charlotte, the Charlotte Knights (International League baseball) in Charlotte, the Durham Bulls (International League baseball) in Durham, the Greensboro Grasshoppers (South Atlantic League baseball) in Greensboro, the Hickory Crawdads (South Atlantic League baseball) in Hickory, the Kannapolis Intimidators (South Atlantic League baseball) in Kannapolis, the Kinston Indians (Carolina League baseball) in Kinston, and the Winston-Salem Warthogs (Carolina League baseball) in Winston-Salem. Some of the major companies headquartered in North Carolina are Red Hat, Inc. (in Raleigh), Bank of America (in Charlotte), BB&T Corporation (in Winston-Salem), Duke Energy (in Charlotte), HanesBrands Inc. (in Winston-Salem), Krispy Kreme Doughnuts, Inc. (in Winston-Salem), Lowe's (in Mooresville), Lowes Foods Stores, Inc. (in Winston-Salem), R. J. Reynolds Tobacco Company (in Winston-Salem), SAS Institute Inc. (in Cary), TW Garner Food Company (in Winston-Salem) and Wachovia (in Charlotte). Airports serving North Carolina include Charlotte/Douglas International Airport in Charlotte, and Raleigh-Durham International Airport in Raleigh. Places of interest in North Carolina. Play golf in North Carolina. Books with travel information for North Carolina. Information and books about the history of North Carolina. Information about skiing for North Carolina. Towns and cities in North Carolina.